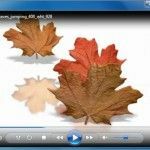 Animated Autumn Wind PowerPoint Template brings a stunning video animation of flying maple leaves in the gentle Autumn wind. 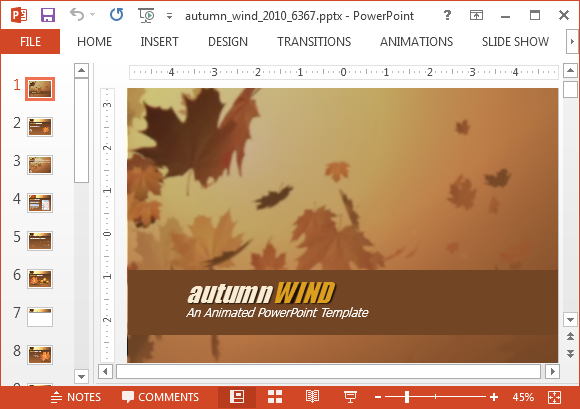 This video animation serves as a background for the opening slide and is also featured in sample slides. 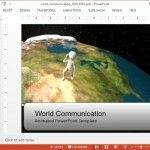 With more than 20 sample slides, this template provides all that you need for making a presentation on any topic relevant to the fall season. 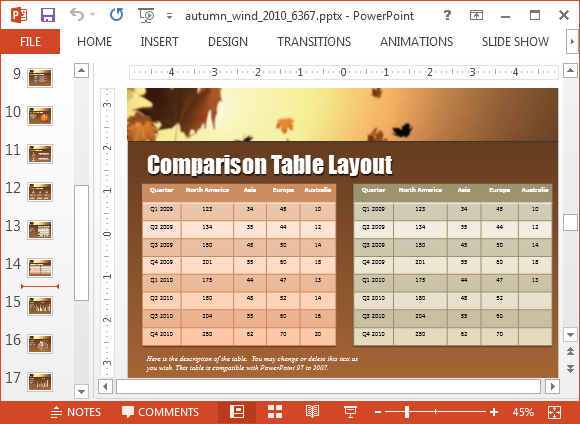 Whether you need a slide for adding a lot of text, need a picture page, comparison page, editable charts or want to make comparison tables, this template has editable sample slides that can make your job easy. 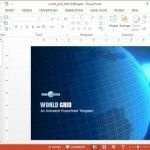 As the objects in this template are editable, movable and removable, you can use the clipart in slides by copying it around your presentation. 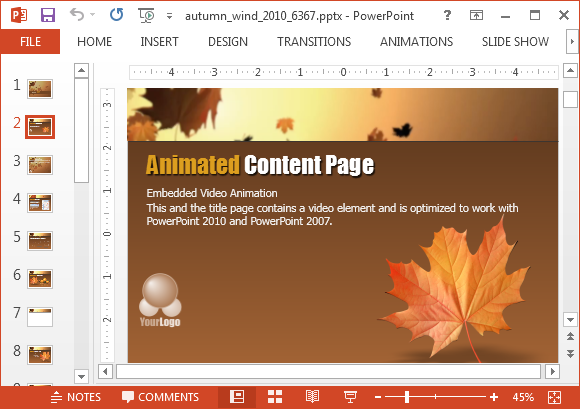 You can also drag to resize the clipart images and replace slide objects with your own content. 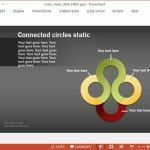 There are a number of slides with sample charts, SmartArt diagrams and tables. You can edit these easily by adding your own statistics and text. 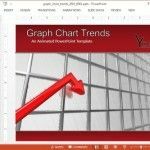 The readymade content is matched with the brownish color tone of the template to make the content within charts and diagrams to standout, however, you can also remodel the given content. 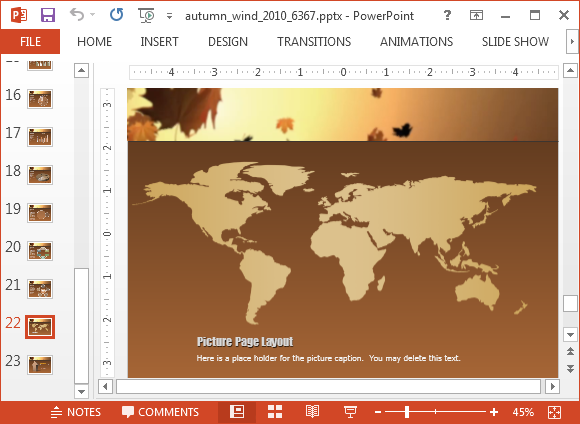 There are various picture layouts in this template, including single, two picture and three picture layouts. You can add images to replace the sample picture to present, diagrams, infographics and other types of illustrations by adding your own images. 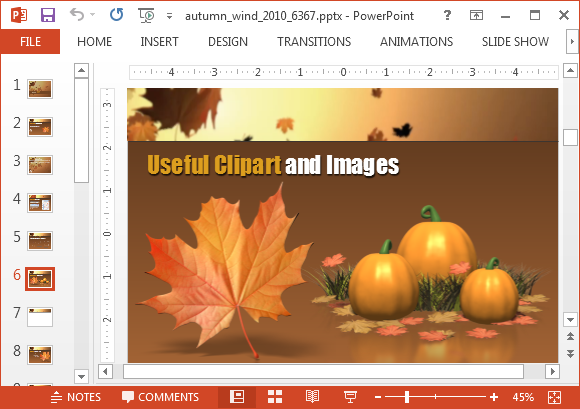 Alternatively you can check more animated clip arts for presentations in PowerPoint in our related post.